For those of us managing either food allergy or celiac disease, we know how expensive it is to purchase safe foods. Yet, imagine if you couldn’t afford to purchase safe foods for your child! And to make matters worse, when you went to a food bank, there were no safe foods for you to obtain. Or imagine if you applied for WIC (Women Infants & Children) only to find out that there are no substitutions for peanut butter, milk or whole wheat bread. This is why FEI was created. Establish nutrition policies that reflects the needs of food insecure individuals with special diets in school and community settings. Push for legislation that provides Insurance coverage of gluten free and allergy friendly foods for a medically necessary diet. The amazing part of FEI is that not only do they have a pantry in Kansas City for families with food allergies & celiac disease to shop in. They could also box and ship safe foods to families requesting such from around the USA if they had more funding. This all costs A LOT of money! This is where FEI could really use the assistance of the food allergy community. There are many areas of the USA where families are in need of having a pantry of safe foods set up, similar to what FEI has created in Kansas City. If you have the desire to create this in your community, please contact FEI through their website here. Donations of money are always appreciated. You can donate directly to FEI on their website here. If you’re reading this blog post and need assistance in affording safe food, please click here for more information about qualifications. I applaud Emily Brown and Amy Goode on creating this wonderful organization, and I encourage each of you to support families in our community that can’t afford to provide safe foods for their children by donating your time or money to FEI. For more information about FEI, you can read this article or this article by Allergic Living. The Wonderful Sit By Me Bakery! 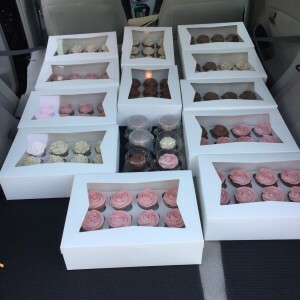 I’d like to introduce you to Steve & Angie of Sit By Me Bakery, a Branson, Missouri based company that creates wonderful cakes, pies, bundtlettes, cupcakes and cinnamon rolls that are baked without wheat, dairy, egg, soy, peanuts, tree nuts, fish, shellfish, seeds, potato, corn, and yeast! And they deliver! For those of you who have attended the Food Allergy Bloggers Conference in Denver, you got to taste these wonderful treats! Not only are they delicious, they are also beautiful! Hello Steve & Angie! 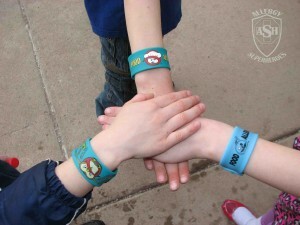 Could you please share with us what food allergies your family manages? Hi! Thank you for interviewing us! I (Angie) am allergic to milk, tree nuts, lettuce, and yeast. Steve is allergic to eggs, soy, and corn, and lives with Celiac Disease. Our oldest son is allergic to tree nuts. Our youngest son is allergic to tree nuts, soy, shellfish, and a long list of seeds. How did Sit By Me Bakering come into being? I write a blog about mental health and chronic pain issues, and Steve is an environmental scientist. A year ago while at Enchanted Grounds, a coffee shop that sells board games, and hosts gaming meet-ups, I turned to Steve and asked if he thought we could open a similar establishment, geared toward the food allergy community. He said yes! That’s how Sit By Me Bakery was born. Are your children part of the baking process? What do they think about this wonderful business? While they do cook and bake, our sons do not help with business baking. They are, however, willing to be taste-testers, which seems like a great job, but actually requires a good measure of courage! They are excited about our business and we’re grateful for their interest and encouragement. 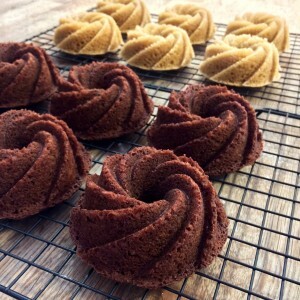 How did you find yummy recipes for cinnamon rolls, cakes, bundtlettes, pies and cupcakes without the top 8 plus without yeast, corn, seeds, potato and corn? We started by converting old, basic recipes from the Betty Crocker Cookbook, but it didn’t go well. We read a lot, studied ratios, and began building recipes from scratch. Our current bakes are the culmination of five years, countless tears, and many, MANY experiments in the trash! Remember those taste-testers I mentioned? You can thank them for our delicious bakes! They worked very hard! Do you plan on having a store front in the future? Our vision is a commercial space where we serve desserts and coffee, and host meet-ups for food allergy individuals and families. It would also be great to meet the needs of more people by shipping bakes and getting our mixes onto market shelves. 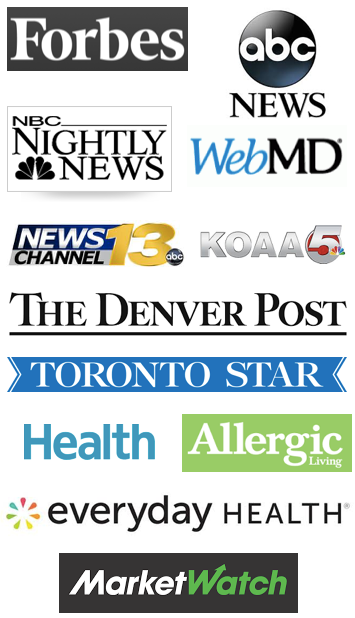 Thank You to Colorado’s food allergy, Celiac Disease, and EoE community! We look forward to growing into a bakery that not only delivers your birthday cakes, but also invites you into a safe space for a slice of pie and a coffee. Thank you Steve & Angie! 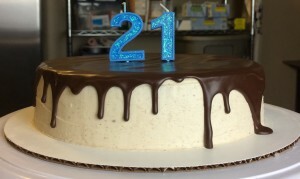 Nicole’s Note: I ordered a cake from Sit By Me Bakery for my son’s 21st Birthday to be delivered to his apartment near the University of Denver (when the company was still located in Denver) to surprise him. I’ve always had to bake cakes for him because of the cross contact issues in all the bakeries near our home in Colorado Springs. My son said the cake was absolutely delicious – it’s the chocolate cake with vanilla frosting and ganache on the top – and a wonderful way to celebrate his birthday with his 3 roommates! 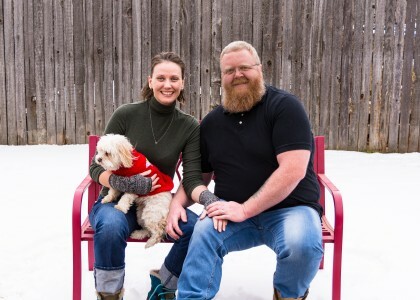 Angie and Steve experienced a sudden change of circumstances and subsequently moved their family and business back to their previous home of Branson, Missouri in January 2018. Their storefront bakery will open in Historic Downtown Branson in May 2018, and they look forward to serving both the local community and tourists. 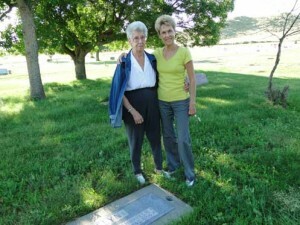 They visit Denver frequently, and have plans to make deliveries a part of those trips. In addition, some Sit By Me Bakery treats will soon be available for mail order! Angie and Steve thank the food allergy community for their continued support. 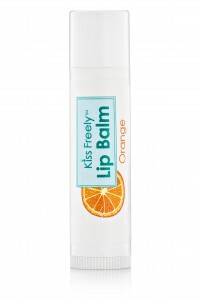 Kiss Freely with Allergen Free Products! Kiss Freely products are free of the 8 major allergens and then some! They avoid the use of other potential allergens such as sesame, shea butter, peas,coconut, avocado and sunflower seed. Below is an interview with Jennifer Kurko, the Founder of Kiss Freely, to find out about these wonderful products. Hello Jennifer. Can you tell us how you thought of creating Kiss Freely? My oldest daughter was diagnosed with multiple food allergies when she was 9 months old. I really thought we were beginning to navigate life with food allergies pretty well. Until one night when I kissed my daughter on the cheek and she broke out in horrible hives. I knew it was not from the food I had eaten because we keep a house that is free from her allergens. It actually wasn’t until a few days later that I realized it was my lip balm. It contained almond oil, Up until that moment, I had not thought to look at what was in personal care products. I went through everything in the house and threw out almost all our lotions and lip balms. All my makeup. I wasn’t able to find a safe line of products and as most food allergy moms know, you are already making a ton of food so making my own lip balm didn’t seem like too much of a stretch! From there I began making body butter and make up. Friends began asking me to make them products. My daughter one night at dinner said, “I can’t be the only one who needs special lip balm. You should sell them.” We formed Kiss Freely so that people who did need “special” lip balm and other products would have those options. What allergies do you manage in your household? My oldest daughter is allergic to dairy, eggs, tree nuts, peanuts, sunflower seeds, flaxseeds, beef and sesame. My youngest daughter is allergic to eggs and is in the process of being tested for EoE and celiac disease. What makes Kiss Freely so special for the allergy community? Kiss Freely is unique in that it is the only cosmetics and personal care items to cater to the food allergy community. It is top 8 free. I also took great care to make sure we did not include other highly allergic ingredients so we are free from a lot of thing such as coconut, sunflower, corn. I completely understand cross contamination. Our workshop is top 8 free. We use dedicated equipment for all our products. I also wanted the products to be as natural and environmentally friendly as possible, so all our products are vegan. We use organic ingredients whenever possible. I also take custom orders. They are my favorite because I know someone is able to participate fully in an activity or finally wear their favorite color lipstick after years of being allergic to it. I make a ton of custom dance orders and I am in the process of making the black under eye color for a young baseball player. I cry every time I get a picture of the person wearing our products. What is your top selling product(s)? Orange lip balm is our best seller. Our face paint is a close second though! I love the face paint that you sell. Have you had any customers that can’t tolerate this product? It was so nice to see so many kids get to use face paint for the first time! We have not had any customers who could not tolerate it. I try to use the least amount of ingredients as possible in every product. The products are simple, natural and that really helps most people be able to tolerate the ingredients. I see that a portion of your income goes back to food allergy organizations. Which non-profits do you support? We have supported FARE and FACCT both locally and nationally. We also really like to be involved with supporting local allergy and advocacy groups. That’s the wonderful part of growing as a business is being able to give more back and be able to make a bigger impact in the food allergy community. Note from Nicole: My daughter, who has celiac disease and a mast cell disorder loves these products. She too has had multiple reactions to other makeup and has thoroughly enjoyed the products made by Kiss Freely. 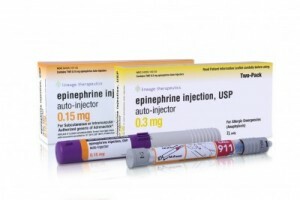 There will be 3 epinephrine autoinjectors on the market effective February 14, 2017: the EpiPen, Adrenaclick and the Auvi-Q. All three devices are available in a Junior strength for children, and an adult strength. 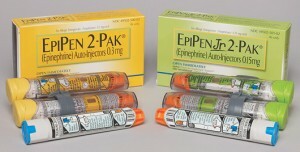 The EpiPen has been around since 1977, and owned by Mylan since 2007. There has only been one recall that I’m aware of, which was in 1998 when Meridian Medical Technologies manufactured the device. Almost 1 million devices were recalled since they weren’t providing effective doses of the medication. The EpiPen training video states that the device needs to be held for 3 seconds after administration. The EpiPen currently has the largest share of the market, which means that more people have been trained on this device than any other. A trainer comes with every prescription. The used EpiPen has the needle protected with the orange cap. The price! Currently the brand name 2-Pak is around $600+ without a coupon. The generic EpiPen will cost you $300, and no coupon is available. With a generic EpiPen available, and the Adrenaclick (generic epinephrine), your insurance company may not cover the brand name drug. The size. Carrying a 2-Pak is bulky, and many young men really balk at this. The short lifespan. Generally the EpiPen expires within 12-14 months, and you’ll likely have to ask the pharmacist for the furthest out expiration date to get this. The Adrenaclick has been on the market since mid-2013. The training video states that it needs to be held for 10 seconds after administration. The cost at CVS pharmacies. With a $100 coupon, the cash price is $9.99. The lifespan. Adrenaclick’s have an expiration date at least 24 months out. Less bulky than the EpiPen. No trainer comes with the package. You will need to contact the company and request to have a trainer sent to you. You can do so here. Fewer people have been trained on the Adrenaclick in school systems and elsewhere. This may change as more people purchase the device and bring it to school, etc. The cost at approximately $400 with high deductible policies if you don’t purchase the device at CVS. The needle is exposed after use. You need to pull both tabs off of both ends of the device before administering it. This can make for confusion as to which end to use for injection, even though it has a red tip. Seconds count in an emergency, and a layperson may have more difficulty with this. 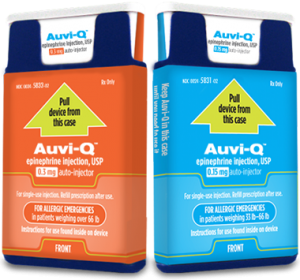 The Auvi-Q was originally manufactured by Sanofi, and was introduced in January of 2013. A recall of all devices occurred in October of 2015 when two dozen of the devices were suspected to have not administered the correct amount of medication. Sanofi no longer manufactures Auvi-Q. Instead Eric and Evan Edwards, the inventors of the Auvi-Q, brought the manufacturing back to their company, Kaleo Pharmaceuticals. Both Eric and Evan, and their children, have life threatening food allergies. The Auvi-Q training video states that the device needs to be held for 5 seconds after use. The device can talk anyone through the administration of epinephrine. A trainer comes with a prescription. Size. It’s about the size of a thick credit card, which makes it easy to carry in a front pocket for men. Cost. Kaleo is promising $0 out of pocket cost, even for those with high deductible insurance!! The needle is not exposed after use. The makers of Auvi-Q have food allergies themselves, as do their children. In other words, they are one of us – the food allergy community AND they have a social conscience when it comes to pricing autoinjectors. The previous recall may be on some people’s minds; however, with the manufacturing moved in-house, I believe this issue has been resolved. The lifespan of at least 12 months. But if you’re paying $0, I don’t believe that’s as big of an issue! 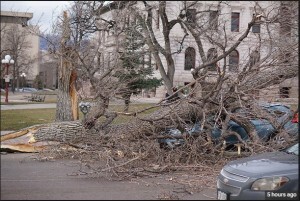 Today in Colorado Springs, we’ve been having horrifically high winds. So high, in fact, that some residents in our city have been asked to “Shelter in Place”. Several years ago, I wrote about Emergency Planning for Food Allergies & Asthma, but I geared the blog post more toward having to leave your home in an emergency. Shelter in Place requires that you remain in your home or the location where you currently are situated. This can be very problematic if you haven’t stocked up on your child’s safe foods or medications at home; or if you are stuck in a store without an EpiPen! Discuss with your family every individual’s needs, and have a box, envelope or carrying case for all items listed below. Always have two unexpired epinephrine autoinjectors on hand. (This means that autoinjectors are always carried, even if eating isn’t planned). At home, we have at least two more as a backup, plus multiple sets of expired EpiPens, just in case! Have a working nebulizer, along with unexpired medications, and clean apparatus tubing and mouthpieces. This is difficult to keep on your person when leaving your house, so we had an inhaler and spacer with us at all times, when our son was younger and his asthma was more active. Have extra asthma medications and spacers on hand. 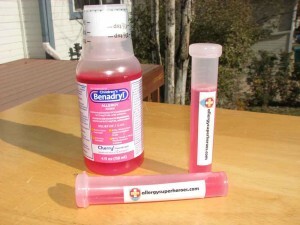 Any other medications that your child may need – Benadryl, Zyrtec, etc. – need to be on hand and within expiration dates. We always keep at least a 30 day supply of all medications. Keep safe foods in large quantities on hand. Running down to the last slice of safe bread, or allergen-free milk, before re-ordering will make for grumpy children. And it will inevitably occur when you can’t run out to the store, or when Amazon is unable to deliver! Now is not the time to try out new foods. Sticking with standard favorites, and products that you know are safe will mitigate any cross contact with an allergen. Always bring a cell phone with you when you leave your home. If you end up sheltered in place, you can contact other family members to let them know where you are. When our son was younger, we never left the house without safe snacks tucked into my purse. Many customers in Colorado Springs lost power for hours of the day today. This is a VERY unusual situation in our city; however, if this occurs frequently in your location, be prepared! Obtain a battery operated nebulizer, or if you have to, have a generator on hand. The key with food allergies and asthma is to ALWAYS be prepared – at home or away from home. Hopefully, you will never experience a shelter in place, but if you plan beforehand, the experience can be a mild inconvenience instead of a tragedy. Hello Dean & Eileen! I’m thrilled to be able to interview you today about your company, Allergy Superheroes. 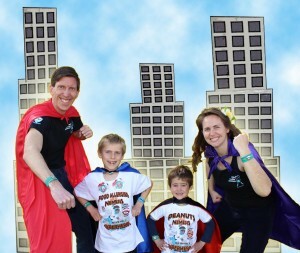 I love the empowerment that comes for kids with food allergies being superheroes. Eileen: Thanks Nicole! We love focusing on the positive too. There’s no better analogy for food allergies than kryptonite. If Superman can have a weakness and still save the day, then our kids can too! Please tell us how your company came into being. Dean: When our boys were diagnosed with food allergies, it wasn’t really a life-altering experience like it is for most new families since Eileen has a lifelong experience with it. But when they started school we became acutely aware that the rest of the world doesn’t really get it yet. When we realized the kryptonite analogy, we combined our love of superheroes with that positive message to help get the idea of food allergies across and spread awareness. I especially loved the teal leaf bags you had available for Halloween. What are your highest selling products? E: Our teal pumpkin products did really well this past October, especially the candy buckets. In general our slap bra celets do really well (and we’re about to release them in more allergens) and everybody loves our single-dose liquid medicine bottles. Born out of my desire not to carry a full (not to mention heavy) bottle of liquid Benadryl with me all the time, those have really made my purse lighter and everybody else loves them too. But my personal favorite is our “I have a kid with a food allergy, you bet I’m a SUPERMOM” travel mug. D: I sometimes wear the slap bracelets even though I don’t have any food allergies. It helps to spread awareness and they’re a lot of fun! What food allergies do your two boys have? E: Our older son is allergic to egg and peanut, though he is finally starting to outgrow the egg and he’s been handling it in baked form for a little more than a year. Our younger son is just peanut. Both of them have a big question mark around some of the tree nuts though, because introducing those has been problematic because of my allergy to them. How do they feel about being a part of your company? E: They love it! Modeling usually requires bribery of chocolate to get everyone through it, but they love being part of this and they know it’s something special. We have overflowing file folders of the artwork each of them has drawn of our characters. D: Our boys are really into superheroes, so they love the idea behind the business and our characters. They wear their food allergy superhero shirts a lot and love helping to come up with new ideas on how to spread awareness. It really is a family venture! Can you share a story of superpower one of them has enjoyed in life? D: Our oldest is very active and outgoing. He has no issues with talking about his food allergies and spreading awareness about them. When a birthday party comes up, his friends know about his allergies so they make sure their parents talk to us so that their birthday treats will include him! He also loves to draw and we can see him doing a lot of the artwork side of the business when he gets older! Eileen, you have had food allergies all your life. What was it like growing up in the 1980’s with food allergies? It was harder to get diagnosed and get proper medication–I had an anaphylactic reaction to eggs at 12 months, but the only prescription I received upon leaving the ER was for Benadryl (it wasn’t OTC), and we weren’t sent to an allergist or even told to avoid eggs (my mom avoided them anyway.) I had some smaller reactions and then another anaphylactic one to nuts in the months before my 4th birthday, and then I was finally prescribed epinephrine, but I wasn’t tested for allergies until I was 6. (By then there was no trace of an egg allergy.) And that was the only testing I had done as a child. Most people hadn’t heard of food allergies. I did a lot of explaining and so did my parents, but it was rare to encounter anyone who had previously heard of allergies or could accommodate them. We didn’t have the internet. As a result, news of food allergy deaths seldom reached our ears so our perception of the risk was less. That may have put us at greater risk, but probably also reduced our anxiety level. But on the other hand, we didn’t have many resources available to us, either. My mom used to receive a monthly newsletter from a now-defunct allergy and asthma organization, and most of the articles were on asthma. If she’d had access to the community we have today, I’m sure our lives would have been a lot different–certainly a lot less isolated. D: Nowadays, awareness is growing, but there is so much more work to be done. It’s hard to fathom going through that with virtually no awareness or support at all. The kids and parents of that time period and earlier are real superheroes in my book! How did you manage to stay safe in school, dating, eating out without the awareness that’s available today? E: I’m going to start by saying that I was pretty lucky to “only” be allergic to tree nuts. If I’d been allergic to, say, dairy or wheat, or if egg had stayed with me, I’m sure things would’ve been a lot harder, because I would’ve encountered them a lot more. Tree nuts aren’t as widely used, so my life was not as restrictive as it could have been. My mom considered it a victory to actually get my EpiPen into the nurse’s office, though she has repeatedly expressed doubt that anyone there would’ve known how and when to use it. We put a lot less emphasis on inclusion back then and mainly focused on “do what you need to do to stay safe.” The world isn’t nut free, and my mom wanted to make sure I understood that I couldn’t always participate in shared treats. When foods came into the classroom I would ask questions, and sometimes I would just do without. I don’t think I ever had a backup stash at school. I don’t think that even occurred to my parents. I think I started self-carrying around 5th grade, which I’m pretty sure made my parents feel safer. I had a fanny pack that year, then somewhere along the line I just switched to carrying it in my backpack. I don’t have very distinct memories of any of that, it just sort of happened when it happened. I got a fairly good handle on what I shouldn’t eat by then, and I can’t recall any school-related reactions beyond early elementary school. Telling boyfriends about my allergy was definitely a priority. We had a “no kiss” rule growing up if my parents ate something I was allergic to, so that transferred over to dating. Generally, I would tell guys that they shouldn’t eat nuts while we were out. I wasn’t forward enough to add “or you can’t kiss me,” at least not early on, but no one ever challenged my rule, either. I can’t say I put any thought into what they’d eaten previously–but then, the first supposed “peanut butter kiss of death” didn’t happen until I was in my 20s, so that was another danger that I simply wasn’t aware of, nor did I fall victim to it. But I didn’t date a whole lot, either. Something else that is very different today is awareness of cross contamination. Some might argue that cross contamination doesn’t have much awareness, but when I was little there was none–and I mean none. We were never warned against it by our doctors, foods never labeled for it, and the general principle we lived by was “don’t eat anything with nuts actually in it.” We knew you couldn’t pick nuts out, but even the concept that you couldn’t use the same knife was something we learned (painfully) the hard way. There were a handful of reactions from my childhood that we traced to contamination as we struggled to figure out the concept, and some other “mystery” reactions that must have been from CC. Kissing, cross contact–basically, these things had to happen a few times before doctors, patients, the news, and lawmakers figured out the pattern and started doing something about them. So when it came to restaurants, we did a lot of educating. It wasn’t uncommon for me (or my parents) to explain what food allergies were to restaurant staff–and after we learned about shared knives and foods touching, we told them not to do that, either. Whether any of them actually took precautions in the back is debatable–but on the other had we were pioneers, laying the foundation policies that restaurants are adopting today. It’s a wonder that we ate out at all–but without the internet shoving food allergy deaths in our faces every few months, the danger of that happening also seemed farther away. At times we coasted through on ignorance and luck. E: It’s been great getting to be part of this community since we started up a few years ago–it’s such a welcoming and positive space. I also blog at www.allergysuperheroesblog.com and I started that up because I wanted to share my perspective of dealing with two generations of food allergies–my outlook is different since I’ve been through it myself, but caring for your allergic child is definitely different than managing your own allergies, too. Most of the time we don’t see the after effects of the things we’ve done, but it’s really all about helping people. On the rare instance that we get feedback that we’ve helped someone, or given good advice, or made someone feel more confident about the future, that’s when we know that we’re doing the right thing. We love all of the connections we’ve made over the past few years! D: It really is the most fantastic community to be a part of! We’ve met a lot of amazing people and we’re continually inspired by them. And when we get to meet them in person at conferences like FABlogCon, it truly is a SUPER experience. Thank you Nicole, we’ve loved chatting with you! 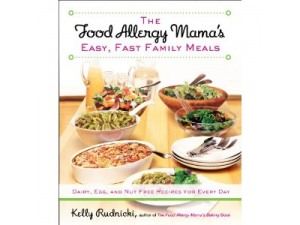 Kelly Rudnicki is the author of the The Food Allergy Mama’s Easy, Fast Family Meals, The Food Allergy Mama’s Baking Book, and Vegan Baking Classics. 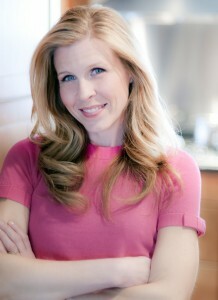 She’s also the creator of the award-winning blog Food Allergy Mama. Her blog has twice been named Babble’s Top Food Blog and ranked #6 in Healthiest Eating. She has appeared on The Martha Stewart Show, Windy City Live, WGN News, ABC News as well as in numerous publications including The Wall Street Journal, USA Today, Chicago Tribune, Chicago Sun Times, Parents, Parenting, Shape, Family Fun, Woman’s Day, and others. As the mother of five young children, one of whom with severe food allergies, Kelly also spends much of her free time advocating for food allergy awareness and improving school nutrition. 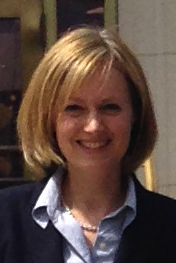 She volunteers and speaks on behalf of food allergy organizations such as FARE, and helped write the food allergy guidelines for the Chefs Move to Schools Chicago, an initiative launched by First Lady Michelle Obama’s Go for the Gold campaign to promote higher standards for food, fitness and nutrition education. Kelly also serves as a Parent Ambassador for Healthy Child, Healthy World. She lives in Southern California with her husband and five children. Kelly, can you please tell us what food allergies you manage in your children and how you found out about them? My 10-year-old son John was diagnosed at age one with severe food allergies to dairy, eggs, peanuts, tree nuts, peas and legumes. The only allergy he outgrew was egg at age three after a successful food challenge confirmation. We found out about John’s allergy like many other parents of food allergic children, a scary reaction. John was nearly a year old and ate one of his first finger foods, a Gerber Veggie cheese wheel which actually contains very little veggies but is coated in cheese powder. He immediately broke out into hives on his face, started coughing and then vomiting. It was a horrifying experience. What was your inspiration in writing your newest cookbook, “The Food Allergy Mama’s Easy Fast Family Meals“? After the success of my first book The Food Allergy Mama’s Baking Book, many of my blog readers routinely wrote me asking for my favorite family meals that are fast and allergy-friendly. As a busy mom of five, they wanted to know how I get meals on the table day in and out. I realized that there was a real need to have a practical family meal cookbook that is no nonsense, easy to use and produces delicious recipes every time. The bonus of this book is that many non food allergy families love the book just as much! What meal is your children’s favorite? My family loves pizza night! Are there any budding cooks in your family? As a mother of four boys I feel it is equally as important to teach them how to cook as much as my daughter. It’s an important life skill that can easily be taught by mastering a few simple cooking techniques and recipes. Cooking is the epitome of inner creativity, and something that should be fun, approachable and not scary. When people say they don’t know how to cook it is usually because they made a recipe that failed them, not the other way around. It’s wonderful to teach our children to feed our bodies good food made from the heart. And in turn they will teach their own children the importance of family mealtime and cooking. The ripple effect is amazing. With 5 kids, do you make safe meals that everyone can eat? Or do you ‘short order cook’ a safe meal and then a meal for everyone else? If I was a short order cook, I would lose my mind! It’s hard enough as it is to cook one meal on a busy weeknight! I choose to make recipes that aren’t fussy, complicated or require a ton of ingredients. They are crowd pleasers. However, one child absolutely dislikes the main dish I’ve made for dinner, oh well. They eat the sides and move on. Parents shouldn’t feel obligated to make everything perfect for their children, it’s really OK to serve one family meal and be done with it. If anything, it teaches children to “roll with it”. Since Mother’s Day is this month, can you share with us any special celebrations that your family has for this occasion? I usually take the day to go for a run and reflect on being a mother and what it means to me. The day I became a mother I was forever changed. Having children forced me to get out of my comfort zone and challenge me to be the best person I could be. I wanted them to watch and learn from not only my successes but most importantly my mistakes. There is no greater reward in my life than my children. I also take the day to remember my own mother, who passed away 16 years ago. My heart broke the day she died, and I don’t think you ever fully recover from the death of your mother. But you do learn, grown and become a mirror of what she was to you. What can you share with us about sending in safe school lunches – anything wonderful and new for kids tired of the same old thing in their lunch bag? I recently discovered the greatest thing about making safe lunches your child will actually eat and enjoy…have them either help or make their own! I admit I stumbled upon this concept out of part desperation, part selfishness. One day I was exhausted, running in a million directions and literally too busy to spend the extra few minutes to make lunches for my four school aged children. My kids were lounging around waiting for me to take them to school and I had an A-ha moment….have THEM make their own lunches. I had rules; make a sandwich or something with protein, a veggie and a fruit. Cracker and snacks were optional. It was a true epiphany! The kids took ownership in their meals, and were proud to make lunches THEY liked. And it was fun for them to be creative in what they packed every day. I do check the end result to make sure there isn’t just frosted flakes packed. But they’ve done a great job and I think they have really learned the value of making your own meals. Thank You Kelly and Happy Mother’s Day! What’s Your Family Tree of Allergies? 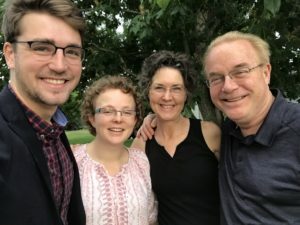 When our son, Morgan, was first diagnosed with food allergies at 18 months old, we weren’t too surprised given the Family Tree of Allergies that exist in our family. Yet, I hear from some parents who have no one in their family with allergies, and can’t understand where their child’s food allergies come from. There are many more possible causes than just genetics for food allergies, which you can find on our website here. Allergies can be passed from parent to child. Children may inherit the tendency to develop allergies if either parent or any family member suffers from eczema, asthma, or food allergies. The specific allergy is not inherited from the parents, merely the tendency to be allergic. If neither parent is allergic research suggests that there is still a 5-15% chance that the child will develop allergies. Research has also shown the children who have a genetic predisposition to produce excess IgE are at least 8 times as likely to develop food allergy when delivered by cesarean section. My son wasn’t delivered by C section, but out of four grandparents, one had severe asthma and hayfever, one has cold urticaria and hayfever, one had shellfish allergy as a child and one had no allergies. That’s a lot of genetics to overcome! Between my husband and I, my husband really doesn’t have any allergies to speak of other than an allergy to cats. Me however, that’s a different story! I’ve been recently diagnosed with a mast cell mediated disorder. In other words, I have an abundance of mast cells in my body, especially in my stomach. I also have multiple IgE food allergies, environmental allergies and cold urticaria. Our college age daughter also has these same issues, so sadly I’ve passed my genetics on to her. There’s so much more that our family understands now about allergies in the environment, food allergies and cold hives – so I don’t blame myself for my kids getting all these allergic issues. I do hope that someday we’ll find a cure, or at least be able to mitigate the most serious of allergic reactions, anaphylaxis. In the meantime, at least I know what it’s like to have allergies and I can help my kids to stay safe!